Today’s watch is one I was offered the chance to play with for a few weeks by Queensland collector Col, who generously sent his newly acquired Sea-Gull 1963 Reissue to me before he’d even had a chance to wear it in. Although perhaps not a brand known to much of the general watch public, Sea-Gull does in fact have a lot of admirers amongst watch enthusiasts for their history and for their affordable tourbillons, of which there are owners even here in Sydney. This is not just some ‘cheap Chinese brand’, as you will quickly discover if you do some research, and there is even a brand boutique in the competitive Singapore market. As well as producing watches under their own brand name, they also provide movements that are used for some other brands. In fact, the Tianjin Sea-Gull company is reputed to produce a quarter of the world’s mechanical watch movements. As its owner puts it, this re-release by Sea-Gull is important because it commemorates one of the most significant watches in the history of Chinese horology. In the world of watch movement geekery, it is especially important. So what is it about the movement of this inexpensive Chinese watch that is of interest? The hand wound column-wheel chronograph ST19 movement has its genesis when an order was received for a government developed chronograph for use by the People’s Liberation Army (PLA) Air Force back in 1961. It was known as Project 304. There were no suitable movements available at the time, and the Venus Watch Company was selling their famous Calibre 175, lock stock and barrel. The Tianjin Watch Factory bought it. The factory pre-manufactured three batches of the watch for official approval, which was duly granted. After the Tianjin Watch Factory received permission to begin mass production in 1963 they completed and eventually delivered, 1400 aviation watches to the Chinese Air Force, powered by a modified Venus 175 they called the ST3. Manufacturing ceased in 1969. The movement was then revived in a number of variants by Sea-Gull in the early 2000s after their takeover of Tianjin. The 1963 honours the Model 304, but the ST-19 in it has also been modified to a number of variants. With black markings and applied gold markers, the 1963 is surprisingly elegant for a military watch, especially because of the use of applied golden markers. At 9 o’clock there is a seconds sub-dial and at 3 o’clock, a 30-minute counter for the chronograph. Both counters have blued hands. The main hour and minute hands are also blued and the chronograph hand is a nice bright contrasting red. The dial has the text “21 ZUAN” which means 21 jewels, and the name of the Tianjin Watch Factory. The dial is described as being silver, but it is much lighter in daylight than it is in dim lighting and takes on, in natural light, quite a different hue. It looks and feels very much like a vintage piece, both in looks and with the use of the domed acrylic crystal, so as a reissue, it gets the ‘feel’ of it just right. Then there is the decorated ST19 movement, which is visible through the screen-printed display case back. The glass of the case back has, in red, Tianjin Watch Factory, a star, and the year 1963. The only minus I have with this watch is in fact to do with this transparent case back, which is an optional purchase. One of the reasons for this watch being a desirable one is the history of its movement. To my mind, having text on the case back detracts a little from this. The 1963 is 38mm and sits lightly and comfortably on the wrist. Although it looks good, the choice of a NATO-style strap does have a slight cognitive dissonance to it, with the official website even calling it a NATO strap, as opposed to a more generic ‘canvas strap’, but there is the option of either getting the slightly more expensive leather strap option. 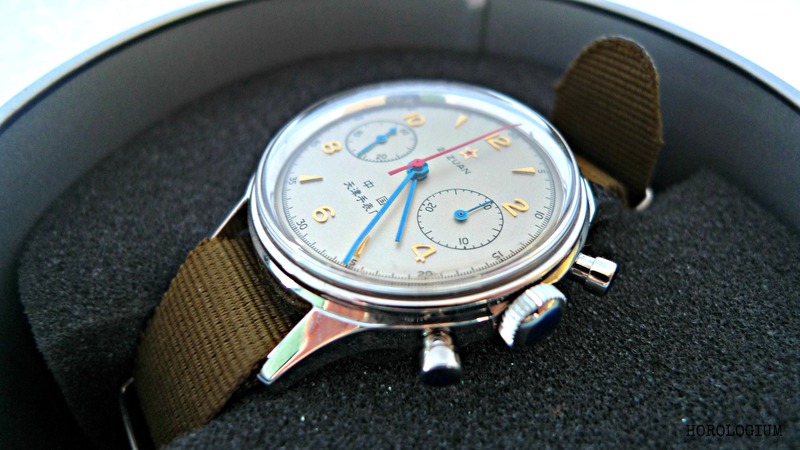 The 1963 is available in a couple of versions (dial colours). One important thing to note is that they do say that its water resistance is 0ATM, so keep it away from the water. Part of what has made this watch have that cool and desirable is that it is a faithful recreation of a vintage watch, down to the movement. It is also just plain old-fashioned good value. For a really very minimal outlay (179 EUR for EU) you get a mechanical column wheel chronograph movement with both historical interest and a great back story to it. As for the chronograph itself, the buttons are nice and crisp to use, though the bottom pusher was just a fraction more ‘soft’, though not to any noteworthy degree. If you want to read a bit about Sea-Gull tourbillons, here is a post I did a few years ago for another blog, and my thanks to Col for lending me this watch. ‹ NEWS : MB&F’s Legacy Machine 2 and what is resonance anyway? would actually get one if a) it’s 40mm and b) solid case back and c) minus all that writing on the dial. Well, it wears like a 40mm because it’s such a thin bezel. It comes with the original solid caseback as well as the display back (which is optional) and the writing on the dial is there because it’s a reproduction of the 1963 model. @Felix – thanks. If you do want to get one, just email me and I’ll tell you where this one was from. Hey, I would be interested to purchase one of those beautiful Seagull 1963 watches. I have just purchased a watch which they have issued in a 42mm diameter. Absolutely love it!! Pricing wise I am over the moon, great quality at the price of a knock off! @Andrew – congratulations. Glad you love it. I reckon they’re really good bang-for-buck.